24 February 1913 Laid John Brown, Clydebank, Glasgow. 13 October 1914 Launched Glasgow. 01 December 1915 Minor collision with HMS Warspite. 31 May 1916 Battle of Jutland, 26 killed, 37 wounded from Barham. 1933? Refit, two funnels trunked into one. 1934 Donald Maclean trains on Barham. Lieut.Comdr. Ranald is pilot of 'Swordfish'. 28th December 1939 Torpedoed by U30 below Canteen Flat, off Flannan Isles. To Liverpool for repairs. 5th January 1940 8 Ganges Boys join skeleton crew from Portsmouth barracks. June 1940 Leaves Dry Dock Liverpool. June 1940 Two men overboard during Destroyer refuelling exercises - rescued by Destroyer. 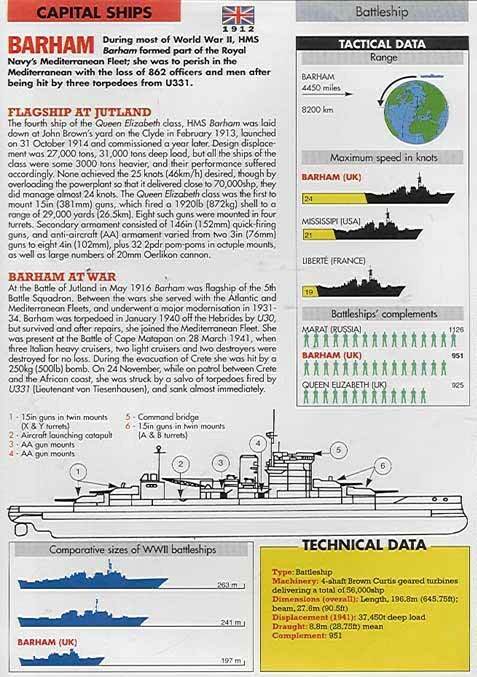 June 1940 During flooding tests, HMS Barham successfully rolls to port, 28 degrees. July 1940 Firing Exercises Scapa Flow. 23/26 September 1940 Bombardment of Dakar, 'Supermarine Walrus' pilot shot down, other casualties? 23/26 September 1940 Barham swerves to avoid 3 torpedoes, which then strike HMS Royal Sovereign. 26 September 1940 HMS Royal Sovereign, listing, is towed by HMS Barham to Freetown. November 1940 Attempted torpedoing of Barham by Italian Frogmen at Detached Mole, Gibraltar. 6th November 1940 To Malta with HMS Berwick, HMS Glasgow. Joined East Med. Fleet. 11th Novenber 1940 Attacked Taranto with HMS Illustrious. Then to Alexandria. 2nd January 1941 Bombarded Bardia. 28 March 1941 Battle of Matapan, Barham helps sink cruiser Zara. Juno picks up Italian survivors. 25 May 1941 Scarpanto airfield bombarded. Stuka bomb explodes in a turret of Barham. 27 May 1941 Barham, QE, Formidable covering last supplies to Suda Bay Crete. 01 June 1941 Crete evacuation completed. June 1941 Through Suez Canal to Durban for repairs. Signal staff work at Guildhall. Aug/Sep 1941 Returned to Alexandria, bombarded Tripoli. 24th November 1941 Sails from Alexandria, Egypt. 25th November 1941 Hit by 3 torpedoes and sunk. 1st December 1941 Last casualty on lists dies. mid-December 1941 Court of Enquiry HMS Woolwich. 8th December 1941 Next of Kin informed missing. 23rd December 1941 Next of Kin informed of deaths. 27th January 1942 Von Tiesenhausen awarded K.C. 23rd February 1942 Casualty List published in The Times. April 1942 Casualty List published in The Fleet. 1945 Admiralty releases film of Sinking.